“Popeye had it right.” So says Susan Bower, assistant director of the Center for Human Nutrition at the University of California at Los Angeles, quoted in this excellent Men’s Health Best Life article. Muscle builder, bolsterer of bone-density and cancer fighter, spinach is a wonder food. And I like it. I do. Especially when it is drizzled with bacon drippings and topped with blue cheese, croutons and bacon. Which probably negates the healthful benefits of the leaf. Spanikopita is also healthier than you think. Eggs, onions, herbs, feta cheese, spinach, of course…. Then there’s that 1/2 pound of butter. But I think we can do away with some of it without sacrificing taste. The Easy and Elegant Life Spanikopita. 2 packages of frozen, chopped spinach, defrosted and drained/squeezed dry in a towel. 1 pyrex casserole dish, I used a 2 QT size. Spray the pyrex backing dish and line the bottom with a 1/4 of the phyllo, spray with butter flavouring again. Add another 1/4 of the dough, overlapping it to form the shape of a cross in the dish. That way all the sides are covered. Beat the eggs and add everything else into the bowl. I used a food processor to chop everything, so the mixture was very easy to work with. Mound half the mix into the dish. Top with 1/4 of the phyllo and spray with more butter spray, brush with a bit of real butter. Top the middle layer of dough (I skipped this step and wish I hadn’t, the pie was very thick, but delicious) with more of the spinach mixture. Lay the remaining dough over this as a top layer and fold the sides of the phyllo from the bottom layer over the edges. Brush with melted butter. Prick with the tines of a fork or make small slits in the top layer to let steam escape. Cover with aluminum foil that has been similarly vented. Do not throw your plates on the ground, it’s touristy and inauthentic. This entry was posted in Entertaining and tagged Entertaining, recipes, summer. Bookmark the permalink. I’m glad I checked in before making the grocery list. Momma’s morning omelette is getting an upgrade this weekend. Looks d-lish! Thanks. And I’m with you on the bacon appreciation. Excellent. This post has got me thinking about a heaping dish of creamed spinach, paired with a huge bone-in ribeye medium well-done and a glass of malbec. I order this combination whenever I go to Mastro’s Steak House in Newport Coast, which serves the finest creamed spinach I’ve yet encountered. In fact there are some people who go there just for the spinach. MC, thanks! I generally go for bacon that is “natural” (i.e. no nitrites/nitrates, uncured, etc. from my butcher. Or Oscar Mayer) I’ll look into Nueskes! LBT, Mrs. E. makes a mean creamed spinach from scratch. It’s a breeze. But Mastro’s sounds like a treat. And a good malbec with red meat is hard to beat. 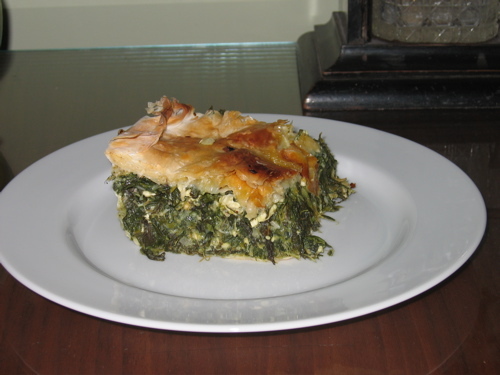 Thanks for posting the recipe for spanokopita! I’ll bet that the white Bordeaux was quite nice as a pairing! A pleasure Claire. Thanks for visiting. And the wine went very well indeed. It sounds-looks-delicious. I’ll be making this soon!